What do you need from me to make my custom figure? How does facial hair work? Do you have any other outfit options? Can I design my own packaging? We ship to almost every country. Please see our shipping chart and prices here. Prices start at $29.99 for just a custom head, and go up to about $119.99 for a custom figure two-pack. The average price is $89.99 for a single custom figure with packaging. Once you place your order, it takes us 5-7 business days to create and ship (assuming your photos are acceptable). If your order is being shipped inside of the US, then it takes about 3 days to arrive once shipped. Please see our shipping chart for how long your order takes to be delivered internationally. Only the mustache and goatee area facial hair will appear on the figure. If you see an outfit that you would like based upon a combination of different ones on the site, email us at info@myfaceonafigure.com and we can put it together for you. We also have a lot of other outfits available for sale on our sister site, www.classictvtoys.com. Below, there are links to our three different packaging sizes. Only download and customize the one for whichever size figure(s) you are planning on ordering. Only the front of the packaging is customizable, not the back. Our only rules are that you cannot cover our logos, or use properties/characters that you do not own the rights to on your packaging. E-mail us your finished design back to us as a .TIFF or .PSD file. When placing your order online, select another package design but leave a customer note at checkout saying that you have or will be emailing us the custom design for your figure instead. We will hold your order until you email us the finished design. If this is too complicated for you, then you can use our online package generator instead. Start Shopping. My Account. Our Policies. 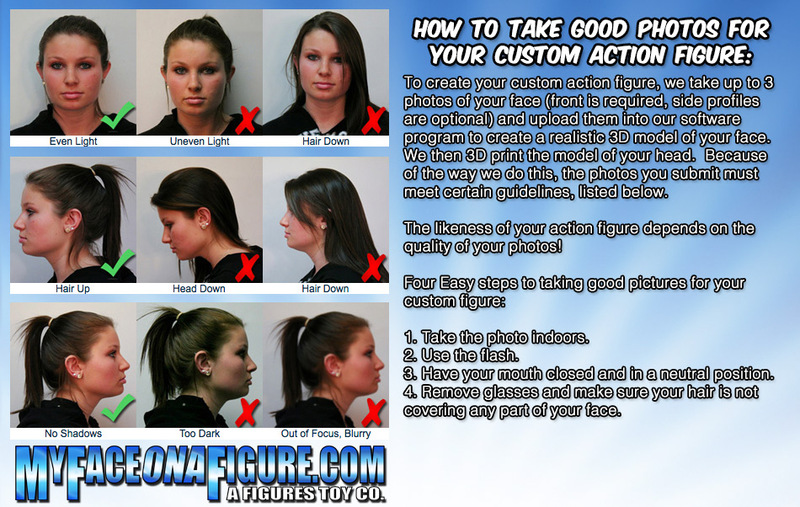 About Myfaceonafigure.